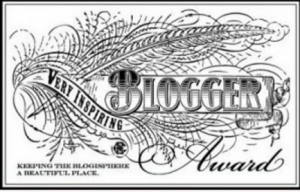 Mom said we should stop all of our busy stuff and wish all of our blogging friends a Very Merry Christmas. Mom says we have some special gifts and we just can’t wait. We hope all the fur people get some extra loving and care at this special time of year. More importantly, we hope everyone….humans and fur people alike….may carry this sense of peace and harmony into 2018. We’re part of Athena’s Caturday Art Blog Hop. Mom, I looked in this bag you brought home and there are no kitty treats! We’re doing the Sunday Selfie Blog Hop again with our friends. Check out what the others are doing. Now be very quiet, Steinbeck. You’ve got to be quiet, Steinbeck. We’ve got some important talking to do. Make sure Mom is not around. She’s in the other room and I think she fell asleep. If I keep my eyes shut she won’t see me anyway. Good, and while you’re at it, keep your mouth shut, too. Now, May is almost over and you know what that means. No, goofball. The next month is June. Hey………..that’s when my birthday is!!! I know. Mom will celebrate it big time like she does with all of our birthdays. So, why do I have to be quiet about that? Mom already knows. But also in June is Mom’s birthday. It is??? No wonder I like her so much. Anyway…………..we have to try to do something special for her. Do you have any ideas? 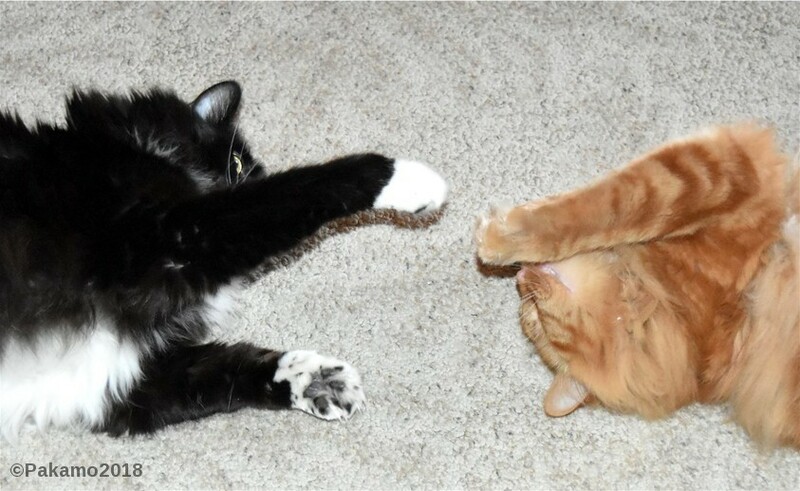 I can share my catnip with her…..or let her use my red dot toy. Boys???? What are you doing??? Nothing, Mom………and I’m not up on top of the computer desk. Nothing, Mom………I’m just chewing my fingernails so you don’t have to clip them. It’s a lovely spring day here. While Mom was at that working place, Hemingway and I just lounged around admiring our toes! Here’s a picture of the front of my toes. See that chewed spot by my foot? I was trying to hide that. Mom said that’s some of my beaver-wanna-be work. She says I’m really good at it. Here’s my cute pink foot pad. See the little tufts of fur? Here are my pink toes with my fluffy tail and more toe tufts. Good grief, Steinbeck. Do you really think our readers are interested in your body parts? M…O….M!!!! Steinbeck is sticking out his tongue again!!! Mom said it’s my turn for the selfie, so here goes. First I had to figure out where the flashy box was. Mom always hides it from us. I finally found it but I didn’t know how to use it. I asked Hemingway and he wouldn’t tell me. He kept saying that I would just get in trouble. How’s a little guy supposed to do a selfie if nobody helps? Here’s what I finally came up with. In case you’re wondering, I was looking for the button to push for the selfie. I never did find it so I don’t know how this picture happened!!! Spooky things seem to happen around me. 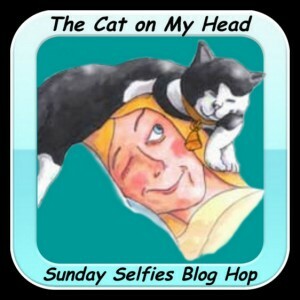 I told my friends I would remind all of you to check out their pictures on the Sunday Selfies Blog Hop. They all did great!!! Steinbeck, what are you doing? You aren’t messing with that plant, are you? Nope, I was just rearranging some of the leaves and checking to see if it needs water. Mom told you to leave that plant alone. I’m just showing her my tiger pose and not messing with the plant. Our Sunday Selfie is actually a DOG!!!! How did Mom let this happen?? Steinbeck, you’re too little to know about the dog who used to live here. However, we have two “cousins” who are dogs. They bark, like the dog behind us and the dogs on the side of us. Except that Axel and Champ don’t bark at me ‘cuz they’re my buddies. So a dog is something that barks. Well, it’s more than that. Mom’s niece has two dogs and one is a really, really big one! Stella is what they call a Newfoundland and she’s even bigger than me! I saw her when she was over here and I didn’t want to get anywhere near her. You’re still little so you don’t know that the dogs can be our friends. I’ll help you learn that. Will I have to bark?